I usually see about 2-3 snakes per year when I mow. And I HATE snakes. No, really, I REALLY hate snakes. My head knows we have no poisonous snakes here in southern Minnesota and I know there isn’t anything I should be afraid of, but I absolutely hate how they look and how they move. Shivers go down my spine and my heart nearly stops when one is within my eyesight. Even anything remotely looking like a snake (like a green garden hose in the grass) freaks me out! Yes, a portion of the ground that I mow is not smooth and flat. Oh, let’s be honest, most of it is not smooth. Believe me, I envy those lawns that are so smooth you literally could play a game of bowling on it. Gouges in my lawn caused by our tractor as it removed snow from last winter really makes a mess of my lawn. This last year was particularly bad. Ruts and piles of soil rubbish everywhere! Mowing around and through this is not fun. 3. A lawn mower with issues. Don’t get me wrong, I like my lawn mower. It has some great features. I love that it takes a 60″ cut and I love the zero turn capabilities. But it needs to see the walls of a repair shop. The fuel and water temperature gauge does not work. After five hours of lawn mowing, I wonder when I will be sitting out in the middle of the tree orchard because I ran out of gas. 4. Referring back to #1. Yes, I hate snakes but I also have other “wildlife” that tries to take up residency in my lawn. We have animals that dig holes in the ground and then leave a pile of dirt from the dug up hole. Just last week I had a family of baby rabbits in a nest that was residing in my lawn. 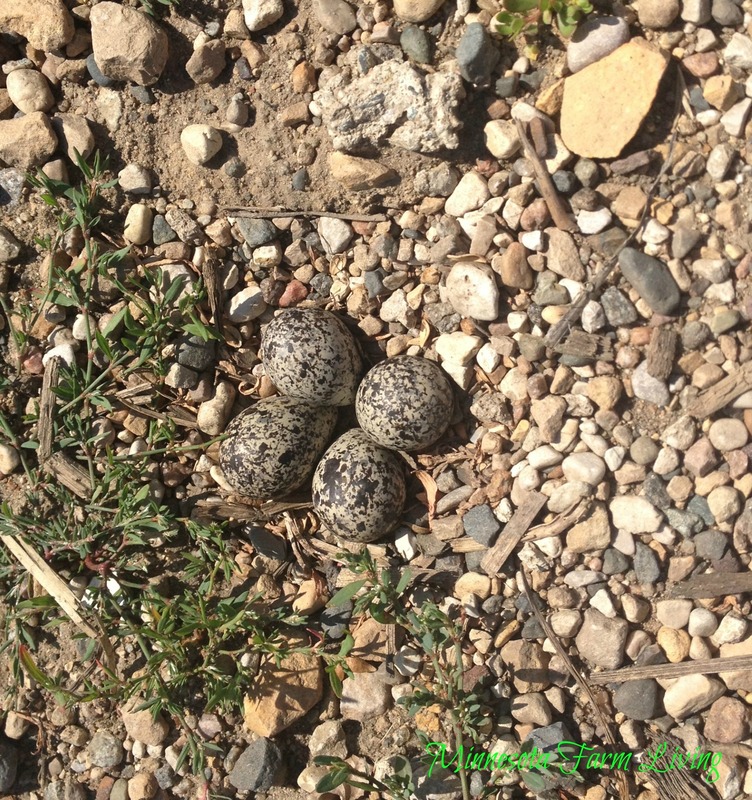 Also, I have a mother killdeer that completely freaks out as I mow by the gravel where she has laid eggs. I wish they would just find another place to set up home because I don’t like seeing tiny baby rabbits scurrying everywhere (because I really don’t want to run them over) and a hyperactive killdeer freaking out and acting like she has a broken wing! 5. Digging dirt out of my eyes and nose for 3 days after mowing. Lawn mowing is a really, really dirty job. No getting around it. No matter how careful I am I look like I just crawled out of a hole in the ground. Dirt is EVERYWHERE. Dirt in my nose, eyes and ears. When I finish my job, I strip my clothes and head for the shower. Immediately. And, yes, sometimes clothes stripping is done before entering the house. Thank goodness for remote living in the country. But when the job done, I really do like the look and the smell of a freshly mowed lawn. And then . . .I do it all over the following week . . . Totally with you on the snakes. Same reaction! Lol. As I just finished mowing most of the areas on the farm only 4 hours on the rider, I totally understand. I totally agree with needing a shower after mowing, it is amazing how much the bra can catch too. It is always interesting when mowing around farm buildings and grain bins, what might have been left that you do not see, such as the tongue of the trailer that is parked in weeds, remember to duck under the gooseneck trailer, the electric cord to the grain bins, blocks of wood that are used to prop under hitches and other good stuff during the first couple of mowings of the year. Of course, there is the standing water to mow around (we really have not been able to plant due to the excess amounts of rain we have gotten this spring-East Central MN), trying to get close to the electric fence, but not too close, and of course mosquitoes are out in full force. It sure looks nice when it is done though. Oh, yes, the tongue of a trailer parked in the weeds! Because it’s early in the season I can see them fairly well now, but that won’t but that won’t be the case later. And I do love how it looks when it’s done. You are so right on that! Mowing is my job too! I can completely relate to all of the above! I also have dirt in my ears and nose. Not to mention the dirt in the creases of my neck. I don’t have a functioning gas gauge either. I usually run out of gas when I am the furthest from the quonset! After all of the hard work, it’s wonderful to admire the yard after it’s done! Love it! Glad I am not the only one that deals with these issues! LOL! My grandmother hung bird houses on some fence posts lining her driveway and a field. I feel the same way about birds as you do about snakes, and I definitely don’t want them poking their heads out or, worst case, flying out and hitting me in the head, as I drive by for a clean cut. I think this’ll be the year those houses find a different spot on the farm. It’s funny how we all have these fears about something. We do get by somehow, but not before a hard pounding heart when we see what we fear! Ahh, yes, Cathy. Or we have deep ditch areas where you are only sitting on half of the mower and you really do have to hang on. LOL! All I can say Connie! LOL! I’ve found sports bras offer way more support when mowing over the rough spots! Especially with a wet spring and heifers that like to find a short in the fence and play in the yard. Hoof holes are incredibly bumpy. And why do they feel the need to lean things against the building such as gates and what not.